A place that feels like home and is inviting for guests is only a few tweaks away. Although your apartment may look like a tornado has blown through, sometimes it doesn’t take much to whip it into shape. By placing your existing items in a strategic way and purchasing a couple of new elements, you will be well on your way to creating an inviting pad that your friends will want to visit. It doesn’t take much to create a put-together, orderly apartment. Here are ten easy ways to transform your place into an organized, well-designed abode that will be a joy to come home to after a long day at work. Don’t be afraid to use color. Pick one hue and use it generously in many different areas of your apartment. The use of color in general will give your space a bright and inviting feel, and focusing on one specific shade will unify the rooms. 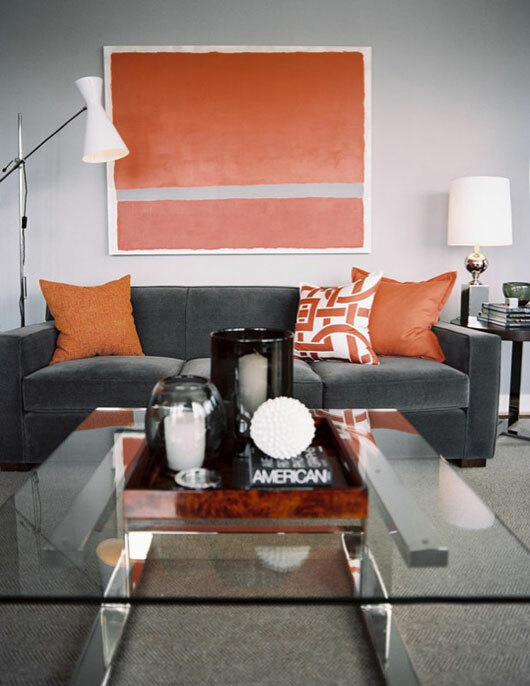 Consider pairing existing neutrals with a bright shade of orange. Even just a few matching accents will give a sense of order and tidiness. Group similar items together. 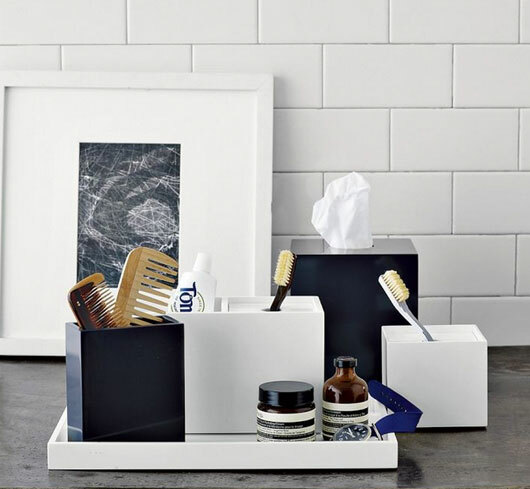 Perhaps you might have a number of products laying around the bathroom… corral them into a decorative box or tray like the one below, and your grooming supplies will now look organized and deliberate. This works for other rooms too; group all of your wine and liquor onto a bar cart, and put your keys, wallet and change into a bowl by the front door. This would be a good opportunity to use that bright accent color that you just picked out. If your landlord allows it, paint the walls. There’s no quicker way to give a drab room a high-end feel. Pick a shade of paint that coordinates with that accent color you chose earlier. A pale gray is a modern and foolproof choice that goes with most anything. 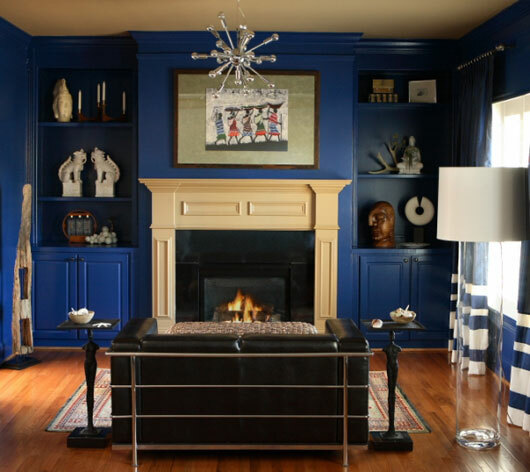 If you’re feeling more daring, go with a darker blue on one accent wall instead. Anything you hang on the wall will pop more than it would on a plain white wall. Buy a couple of plants. Greenery not only filters the air you breathe, but it will lend a feeling of vitality to any room. And most importantly, it signals to your visitors that you have made an effort to create a warm and appealing atmosphere. Houseplants are readily available year-round at Home Depot. If you travel for work, try cacti – they need less water than typical houseplants. And don’t be tempted to stick with the plastic pots that they come in; buy attractive ceramic pots while you’re at the store. Hang curtains. These do not have to be fancy; all you need is a pair of inexpensive panels for each window. Don’t respond by saying that you have blinds, because that’s not enough. 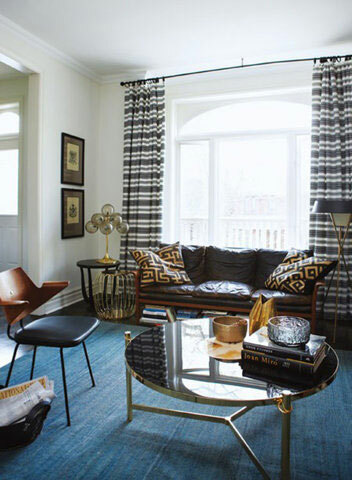 Fabric curtains affect your space in a couple of different, important ways. First, they filter the sun so that you have a warm but not blinding light shining through; and second, they soak up sound so that you avoid that echoing sound that often plagues large apartment buildings. White curtains always look nice, or you could try something that goes with your accent color. Display a couple of old family photos. Family photos are a great way to cover your walls while simultaneously adding a bit of character. They will also be a great conversation piece when guests come over. You can buy inexpensive frames at places like Target or Wal-Mart, and you don’t even have to hang them on the wall if you don’t feel like it – leaning a large frame against the wall is very on trend these days. Add lighting at many different levels. Most apartments come with a light fixture in the ceiling, but make sure you don’t stop there. An average sized room should have between 5 and 10 different light sources. Notice all the different sources in the photo below; a hanging light fixture, a floor lamp, a fireplace, a set of candlesticks, and natural light from the window. Place a small lamp on your end table, and put a taller light on the other side of the room paired with a couple of white candles. Another effective technique is to install lighting behind your TV or in your bookshelves. Ikea has a couple of great options. Use a variety of textures. 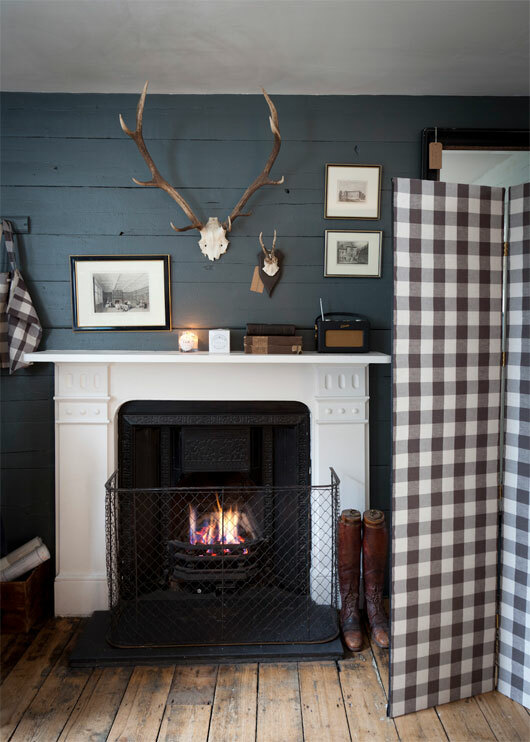 Layering different types of fabrics and textiles will give a room depth and comfort. This can be achieved easily by using different materials such as leather, faux fur and silk. A warm blanket and a set of soft, inviting throw pillows will go a long way to give your space a comfortable ambiance. Put a rug in every room. 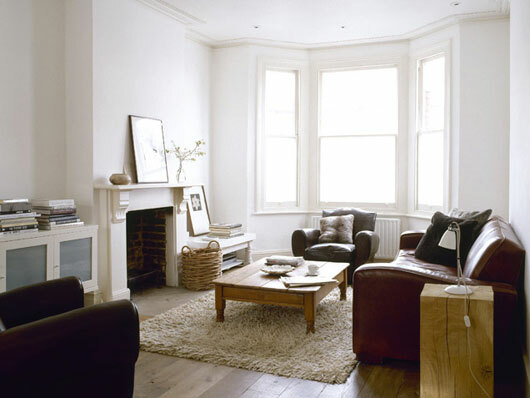 Just like curtains, a rug does many positive things for a room both aesthetically and functionally. It grounds the space, and provides a soft spot for your feet to land. It also creates a bit of a sound barrier, preventing loud noises from echoing throughout the apartment. Rugs can sometimes be expensive, but they don’t have to be. Visit your local Homegoods store or check out Overstock.com to find some great deals. Use metallic and glass elements. This is an easy way to give any place a high-end feel. 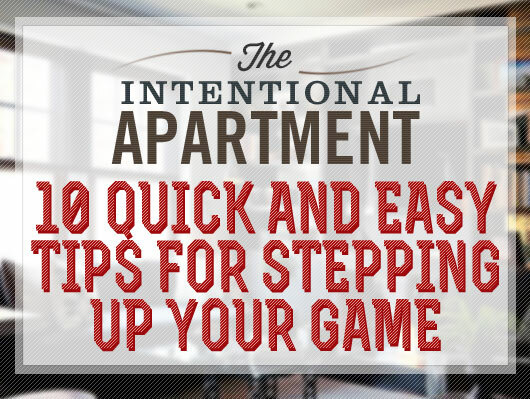 Just because you haven’t made partner yet doesn’t mean that your apartment has to give you away. The glass coffee table below makes the space feel more open, and the silver reading lamps make the room seem like it belongs in a fancy million-dollar brownstone. As you can see, most of these tips are easy to execute but they will have a drastic effect on your space. Just pay a little attention to color, texture and lighting and you will have a comfortable and inviting place to put your feet up at the end of the day. Those are some great ideas. I am about to move into my first apartment out of college and these sound like some great, mostly inexpensive ways, to decorate the place. Love the article Faith! 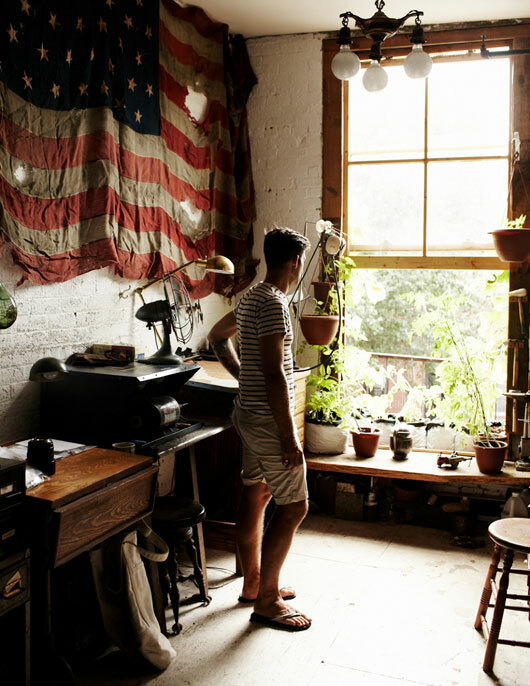 You are really tempting me to redesign my small room. I just moved to Arizona a few months ago and I’m living in a fairly sized room that is quite minimalistic at the moment. Without uploading pictures, I can describe it as very neat with bright green walls (not my choice). However, that does not mean I don’t have a ton of ideas for a future renovation! Some ideas include: painting the alcove white then installing some book shelves, doors for my closet (it is currently very open and visible), some piece of art to hang above my bed, a hanging lamp to tower over my round table, a new chair, and perhaps repaint a lot of my old chipped tables. You’ve definitely gave me more inspiration to work with though! I’ll take the fact that most of the pictures shown have hard wood floors as a hint. Thank you everyone, I’m glad my tips have been helpful! Vincent… sounds like you’re on the right track, best of luck to you. I like these! However, when I try to decorate my home, it never looks like those fancy pictures. It just look like, I don’t know, the same boring room, but with stuff hanging on the wall or lying on the floor. It never have that “nicely decorated” vibe you see on those pictures. Jessy – You may not think that your home looks as good as photos like these, but perhaps it’s just because you’re so used to (and maybe sick of) your current decor… it may look great from an outsider’s perspective! Have you tried repainting some of your furniture or getting a few new accent items? These are easy and inexpensive ways to make your space feel “new.” Good luck! This was an amazing article, extremely helpful for all of us new professionals with Walmart furniture and movie posters. You should definitely have your own Q&A segment, it’s be very popular. Great job! I think it’s really important to have a specific theme in mind with regards to color and material you’re going to use. These are definitely basic pointers ever renter who wishes to decorate should look into before redoing their rentals like the 100 West Chestnut. 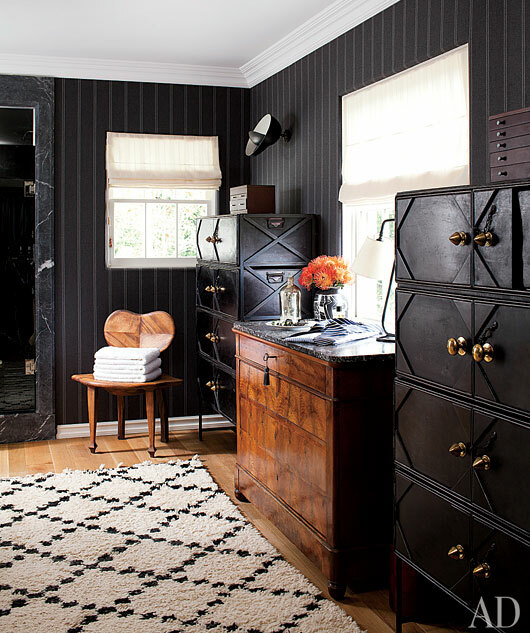 I LOVE that pinstripe wallpaper! Great tips! I use an old cigar box as a bathroom caddy.